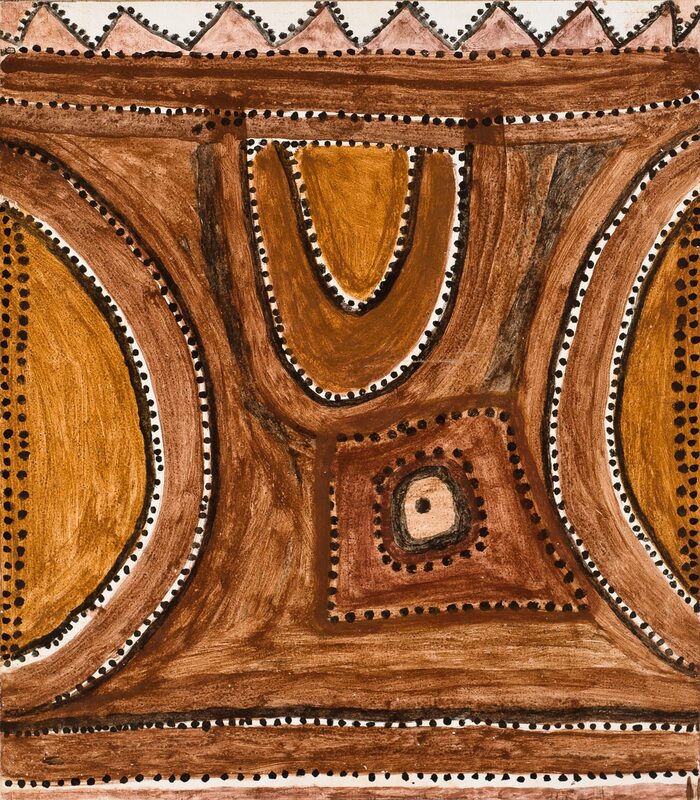 A new show opened today at the Seattle Art Museum, titled Ancestral Modern: Australian Aboriginal Art from the Kaplan & Levi Collection. Here is the short description of the show. With more than 100 works created from 1970 through 2009, the exhibition showcases what has been called the artistic renaissance of the world’s oldest living culture. When the British began settling the continent some 230 years ago, Aboriginal people were regarded as among the most miserable societies, possessing little in the way of culture. Without framed paintings or sculptures on pedestals (the Euro-pean archetypes of art), they were considered a people with no art at all. In fact, because most Aboriginal art was being made for the restricted context of ceremony, it was intentionally hidden from public view. During the last one hundred years, Aboriginal artists have chosen to change that. While they continue to make art for ceremonies that are part of the longest continuing tradition of art known to humanity, they now also create art that is disseminated to an international audience. Welcome to visions of the long haul and big picture of our existence on Earth. Finally, after over 50,000 years of making art, we are able to see what the oldest continuous culture on the planet has in mind. Isn’t it about time? This art takes us into immense deserts and shimmering billabongs, into night skies and underground. It is an aesthetic pleasure unlike any other. 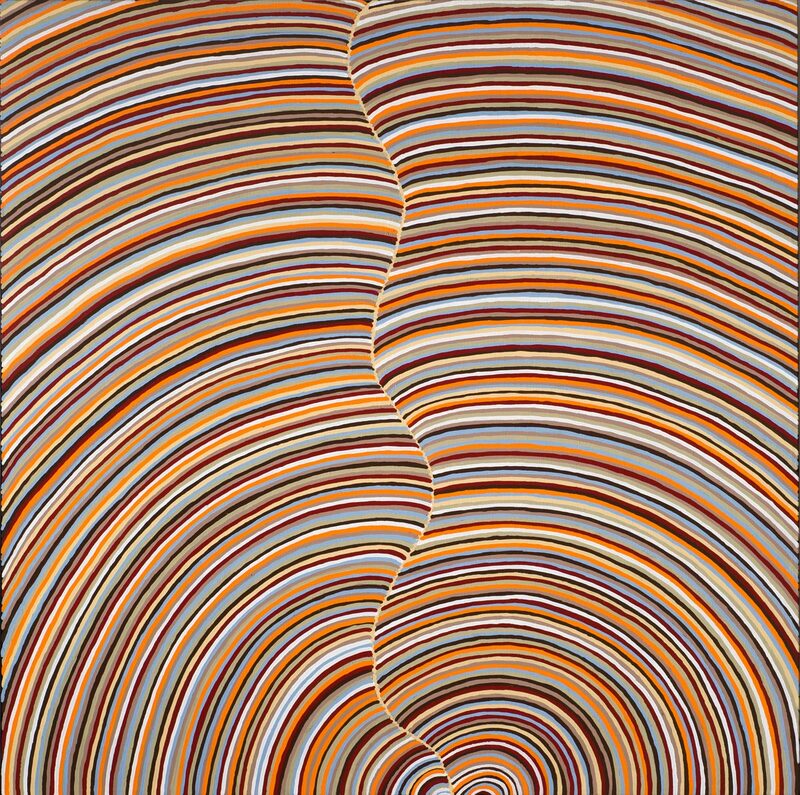 Utilizing contemporary mediums, these artists adapt visual languages that evolved over centuries. What may look abstract is full of symbols and stories that take on common human dilemmas—greed, desire, the search for nourishment, and punishment of deceit. Most often, this art offers veneration of the lands that are in their care and the founding ancestors who continue to provide direction. The collection from which the exhibition is drawn is a promised gift to SAM from Margaret Levi and Bob Kaplan, a local couple who have been building it over the last two decades. As it turns out, I know Margaret, a colleague at the university and political scientist of great distinction. Until the opening celebration we attended last night, though, I failed to appreciate the size and scope of the collection. We arrived in the middle of the half-hour reception, tried a couple of hors d’oeuvres, then went into the auditorium to await the start of the formal program. Eventually, a museum trustee made welcoming remarks and thanked the list of sponsors, then introduced Margaret and Bob, each of whom said a few words about how they built the collection and why. Next up was Kim Beazley, the Australian ambassador to the US, in from DC. Whoever wrote his remarks did an excellent job. He placed the show in the context of aboriginal culture, emphasizing (as in the quoted passage above) the 50,000-year-long development of that culture, its depth, its uniqueness, its importance. We then were the beneficiaries of a superb slideshow-lecture by Pam McClusky, SAM’s Curator of Art of Africa and Oceania. Having heard three of her presentations in the past four months, for three different exhibition openings, I can say that she’s quite gifted at this. Prepped for the art we were to see, we then proceeded to the galleries three floors up in a procession led by Joe Seymour, a local Native American. He chanted and hit a drum as we ascended the stairs and escalators. Then we gathered around at the exhibition entrance, waiting for everyone to arrive, after which he explained the meaning of and then sang a Native song. Ambassador Beazley officially opened the exhibition before placing us in the hands of Djambawa Marawili, an aboriginal Australian. He led us through the galleries in yet another procession, banging two sticks together and singing, accompanied by two young aboriginal men and an older aboriginal woman. Once Marawili had made a loop, he stood in the opening gallery with his companions and sang more songs, with one of the young men playing a didgeridoo while the other man and the woman danced. After several minutes of this, he invited us to see the show, which we did. It was already late and the rooms were crowded. As a result, we didn’t go through the galleries in any systematic way or read the signs. We simply got an overview, examining a few pieces that we especially liked, and happily anticipated an extended return visit. Image and title seem to be at odds in this painting. Swirling lines provide no clue as to where the hen might be. However, the bush hen’s search for seeds, plums and tomatoes is imbedded in the memory of the artist and forms a source of inspiration. Both a glimpse of the dynamic movement of a creature trying to find fruit, and a record of the channels of sandhills, this landscape merges daily life with the eternal forces of the dreaming. 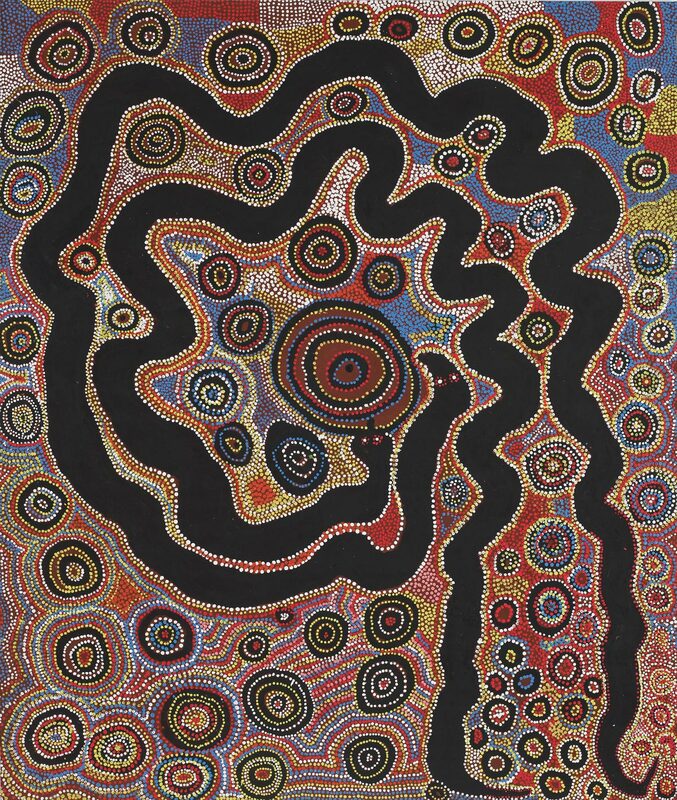 “Dreaming” is a term that often stands for Aboriginal cosmologies that encompass the creation of the universe, and provide a source of ongoing spiritual nourishment. A subtle luminosity comes from Mick Jawalji’s unique combinations of ochres and resins. His application of pigments is washed and soaked into the wood, giving a sense of light as the sun hits the earth or the ancestral forces that infuse the land. The arcs and curves may denote people, windbreaks and symbolism of the desert. While Jawalji paints at Warmun, his traditional country lies some 400 miles away and he tends to work in isolation to evoke the desert in distinctive ways. On the way out, we stopped in the lobby for some food: salmon skewers, garbanzo bean cakes, vegetables. Mini-desserts were being passed by the serving staff. I passed on the tiny cheesecake, but tried some other little cake.